Up and down the western coast of Hokkaido fleets of fishing boats put out to sea in search of some of the world’s best quality seafood. The plankton-rich Oyashio Current attracts and nourishes fish and other seafood, and the low water temperature tones muscle tissue and helps add layers of nutritious and delicious fat. The result? An abundance of superb seafood – uni (sea urchin), tarabagani (king crab), zuwaigani (snow crab), ikura (salmon roe caviar), ika (squid), hotate (scallops), maguro (tuna) and fatty shake (salmon) – renowned for their freshness and flavour. Hokkaido seafood is so prized that the Japanese were trading rice from southern Japan in exchange for Hokkaido seafood as far back as the 13th century. Japanese sailors would make the arduous journey up and down the west coast to trade goods but left the snow-filled Hokkaido winters to the indigenous hunter-gatherers, the Ainu. Hokkaido wasn’t formally settled by the Japanese until 1869 in response to a threat from the Russians who were set to absorb it and neighbouring islands into their empire. Garrisons were built, soldiers were stationed, the green seasons enjoyed, and the winters endured until 1912 when a visiting Austrian-Hungarian soldier – Lt. Col. Thedore von Lerch – trained the Japanese Army to ski in Niseko, and introduced the pastime to the people of Hokkaido. Fifty years later in 1961 Niseko Kogen Kanko Co Ltd began lift operations at what is now Grand Hirafu. Whilst fishing remains an integral and financially important way of life for many on Hokkaido, the waters surrounding the island contribute to a different bounty today – snow. Niseko is in a designated “heavy snowfall area”, however it doesn’t receive the most snowfall in Japan. Falls of 20-30cm in 24 hours are common but rarely does more accumulate in a day. Meanwhile, ski resorts on mainland Japan much further south will often get over a metre in a night – Myoko Kogen northwest of Tokyo is generally regarded as Japan’s highest snowfall resort. So why is Niseko at the centre of the skiing world’s attention? Perhaps a Venn diagram with the following sets can explain it best: quantity, quality and consistency. Niseko sits figuratively in the centre of these three overlapping circles – we get lots of snow, it often falls every day for weeks on end, and we’re sitting in a thermal sweet spot which means that the ambient temperature at sea level – like Goldilocks’ porridge – is not too hot and not too cold. Put it all together and you get perfect dry snow, plenty of powder days, and long winters the envy of ski resorts across the globe. A simple internet search will turn up Mt Baker in Washington State, USA as the ski resort with the world’s greatest recorded snowfall in one season – a whopping 29m recorded during winter 1998-99. It also enjoys the highest unofficial average annual snowfall of any resort in the world, 16.3m. 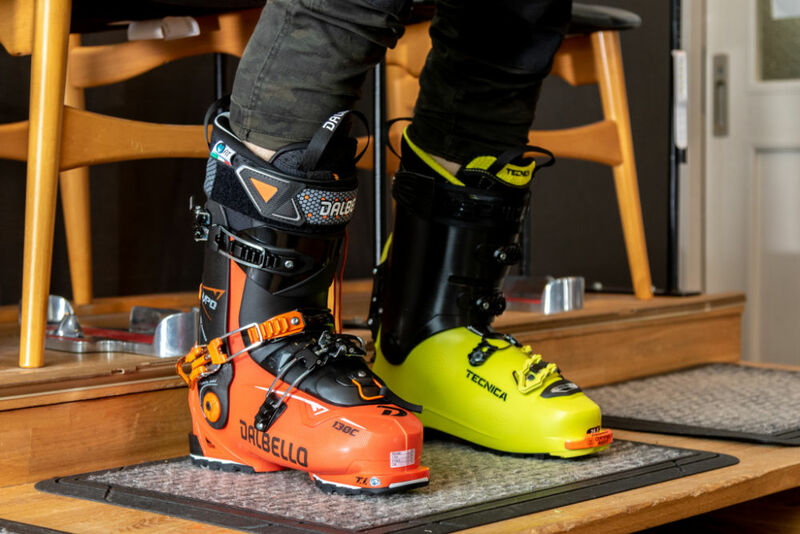 However the stats don’t account for something that is of utmost importance to skiers and snowboarders the world over – quality. Niseko certainly gets comparable amounts of snow to Mt Baker, and Myoko Kogen and others may trump it, but Mt Baker doesn’t get anywhere near the quality of snow Niseko does. Located in the same region as the US’s rainiest city, Seattle, Mt Baker’s high altitude turns deluges of rain into deluges of snow. Plentiful, but moist and heavy. Other Pacific Northwest resorts get similarly consistent snow, but at lower altitudes it’s wet, and big, dry falls are few and far between. By comparison, the Lake Tahoe resorts in the Sierra Nevada mountains of California and Nevada further south are known for getting big dumps of more than 2m in one storm. But this happens infrequently, and the snow isn’t usually top quality – it has the unenviable nickname of “Sierra Cement” due to its concrete consistency! What about Utah with its self-proclaimed ‘Greatest Snow on Earth’? It can’t be denied Utah gets beautifully light, dry snow. But while Utah folk may disagree, it lacks the consistent, plentiful falls which Niseko revels in. Utah folk coming through town will often whisper Niseko has it hands down over their home state. Heading north of the border, poster child Whistler’s snow, like the Pacific Northwest, tends to be on the wetter side. However head a little inland to its cousins in Interior BC – Red Resort, Fernie, Kicking Horse – and by the time the weather reaches this point much of its moisture has been wrung out, leaving crystal-dry powder but not huge amounts of it. Europe meanwhile is generally high and cold enough to get great dry snow, and it can fall in large quantities, but is generally pretty inconsistent. Italy is well known for its feast and famine weather patterns with unprecedented dumps of snow, followed by seasons of dry winters. What Niseko doesn’t pretend to compete with in Europe is plentiful bluebird days, that amazing alpine scenery and outdoor après wining and dining. One place that certainly does go toe-to-toe with Niseko in terms of quality, quantity and consistency is Alaska – but it’s not for the average ski tourist. Alaska gets huge amounts of beautiful snow but on the back of powerful yet cyclical weather systems that can create treacherous avalanche conditions. And you’re going to need a heli to reach the best of it. So let’s come back to Niseko. You might have noticed some consistent themes above – there’s a correlation between proximity to an ocean and distance from the coast that generally plays a key role in our three variables: quality, quantity and consistency. 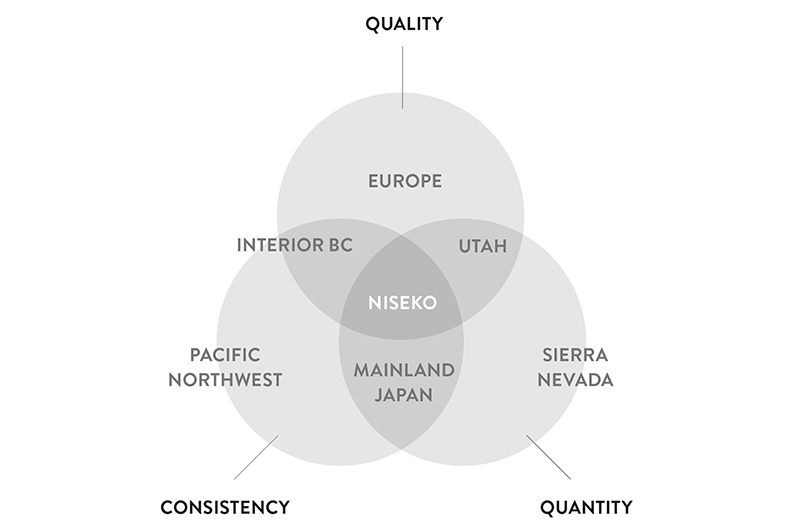 So what is it about Niseko’s locale that makes it tick all three circles in our Venn diagram? If adjacent oceans fuel snow generation, why aren’t the western coastlines of the US, Canada and Europe bombarded with constant perfect snow as well? I don’t want to get too technical so I’ll liken the Niseko powder phenomenon to a high-performance Japanese sports car. I’ve narrowed it down to four key elements that combine to create this miraculous snow-generating machine. A continental mass of cold air is created over large expanses of frozen ground and darkness in north-central and north-eastern Russia, which continues to cool as it travels across the Arctic region. 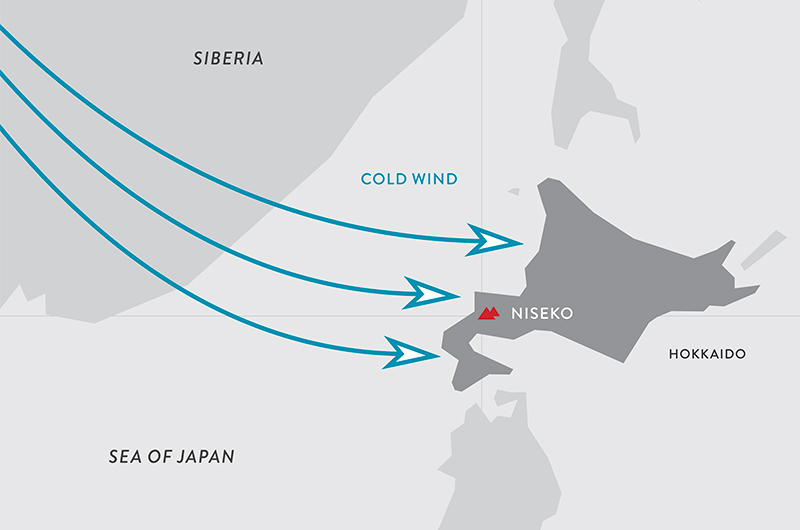 When the weather patterns align for Hokkaido skiers, this air mass travels with prevailing winds from the northwest on a southeasterly flow across the Sea of Japan and on to Hokkaido. The comparatively warm water of the Sea of Japan adds fuel that helps drive the pistons. The cold air that leaves Siberia actually does so under perfectly clear blue skies. Shortly after that cold air meets the warmth rising off the ocean it vaporises, forming clouds that build and build as endless streams of cold air continue to push them eastwards. It’s a phenomenon known as “ocean-effect” snow. This snow doesn’t come from storms – it’s simply a stream of cold air that in our case can last for weeks on end, as long as the northwest airstream holds and keeps pushing that cold air mass down from Siberia. Hokkaido itself is not particularly far north but it is perfectly positioned to feel the full brunt of the cold air mass from the northwest. The freezing level on Hokkaido drops to sea level and remains that way for much of the winter, which is why we see snow accumulating even on the beach. The lightest, fluffiest “stellar dendrite” snow crystals typically fall with light winds and ambient temperatures near -7C, a regular occurrence over the majority of the Niseko winter. In addition, these sustained below-zero temperatures maintain the quality and structure of the snow that has fallen. 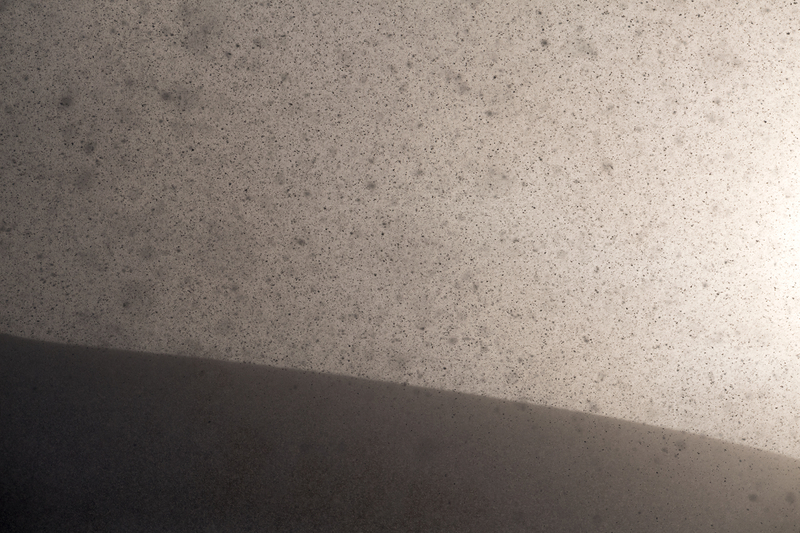 Fresh, uncompacted snow is composed of a high percentage of air trapped among the dendrite “tree-like” structure of the accumulated snow crystals. 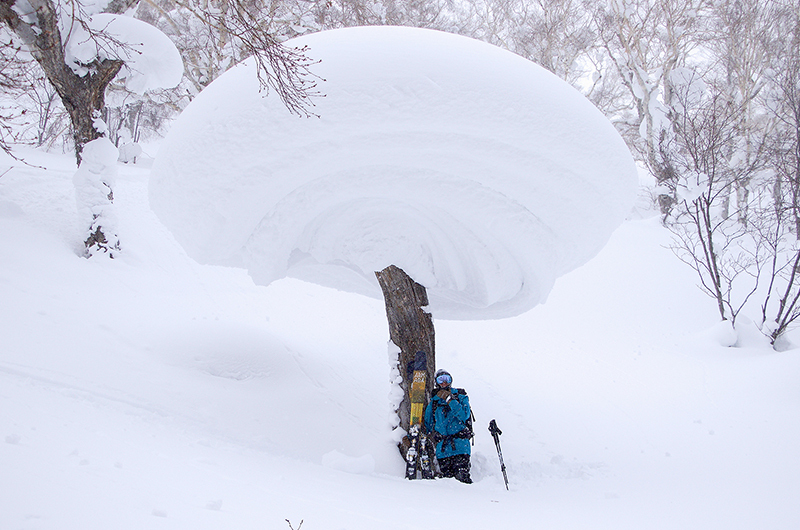 Niseko’s snow has similar characteristics to Utah’s, containing 92-96 percent trapped air. As the clouds, now bulging with moisture, reach the mountains on the coast they’re forced skywards causing them to cool, condense and release their cargo as the perfectly formed crystals described above, until they reach Niseko, just 20km from the coast. The icing on the cake is Mt Yotei, the huge volcano blocking low-level weather from continuing any further, again forcing moisture skyward resulting in a double whammy of snowfall above Niseko. Taking all this into account, it seems like you could just say Niseko has lucked on to being in the right place at the right time. And if you’re here at the right time when the classic north-westerly weather pattern sets up – what locals call the “Niseko Express” – you can expect the skiing equivalent of an all-you-can-eat buffet at a five-star hotel for your entire trip. Expect 10-40cm top ups literally every day for weeks on end. While you can’t predict mother nature, and even Niseko suffers from lower than usual snowfall winters, let’s go back to the easiest-to-gauge yardstick: quantity. Niseko can generally expect somewhere between 10-15m of snow falling at village level most winters, and a whole load more up top. Taking a look at a worst-case scenario, Niseko’s lowest snowfall winter on record still dropped 7.47m at our nearest official met bureau recording station in Kutchan (lower than the mountains). The vast majority of ski resorts in Europe and North America usually top out at 7m per season. 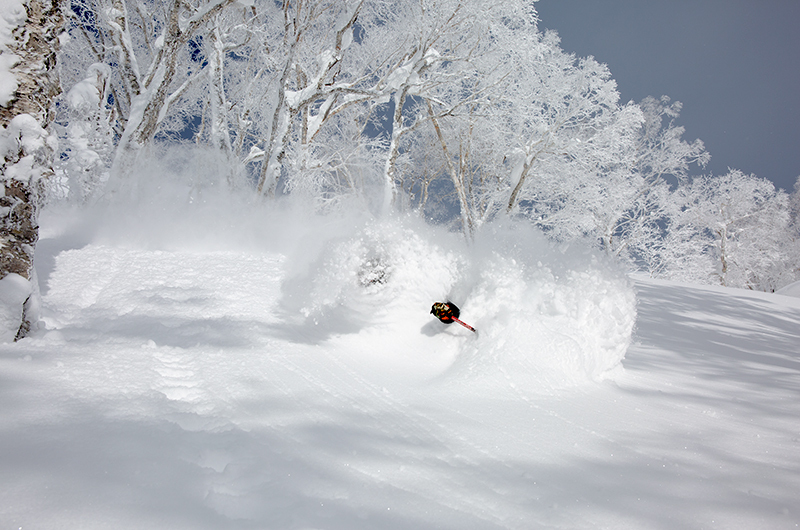 So in the words of the Human League – for many ski resorts around the world Niseko’s “worst is better than their best”. 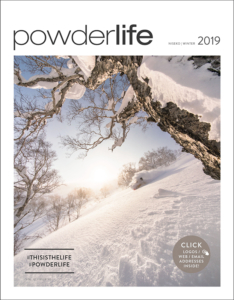 Sign up and we’ll send you the next Powderlife and Summerlife magazines after they’re published and occasional other informational or promotional emails.